With the global rise in incidence of cancer and infectious diseases, there is a need for the development of techniques to diagnose, treat, and monitor these conditions. The ability to efficiently capture and isolate cells and other biomolecules from peripheral whole blood for downstream analyses is a necessary requirement. 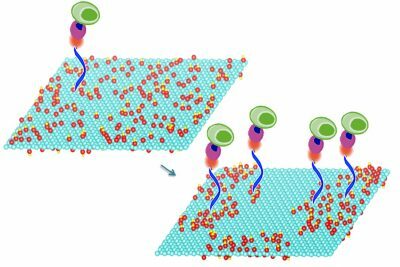 Graphene oxide (GO) is an attractive template nanomaterial for such biosensing applications. Favorable properties include its two-dimensional architecture and wide range of functionalization chemistries, offering significant potential to tailor affinity toward aromatic functional groups expressed in biomolecules of interest. However, a limitation of current techniques is that as-synthesized GO nanosheets are used directly in sensing applications, and the benefits of their structural modification on the device performance have remained unexplored. Here, we report a microfluidic-free, sensitive, planar device on treated GO substrates to enable quick and efficient capture of Class-II MHC-positive cells from murine whole blood. We achieve this by using a mild thermal annealing treatment on the GO substrates, which drives a phase transformation through oxygen clustering. Using a combination of experimental observations and MD simulations, we demonstrate that this process leads to improved reactivity and density of functionalization of cell capture agents, resulting in an enhanced cell capture efficiency of 92 ± 7% at room temperature, almost double the efficiency afforded by devices made using as-synthesized GO (54 ± 3%). Our work highlights a scalable, cost-effective, general approach to improve the functionalization of GO, which creates diverse opportunities for various next-generation device applications.